Millions of links are shared on the web every day, and many people choose to use Bitly links for a variety of reasons. Whether you use the web for personal or professional reasons, you might want to consider using Bitly too. Bitly is mostly known for being a popular URL link shortener, but that's not all. In addition to processing billions of clicks of web links every month, Bitly is also a powerful online marketing tool used to track clicks, see site referrals and get an idea of which geographical locations most clicks are coming from. If you go to the Bitly website, you can paste in a link in the field in the center of the screen to have it shortened automatically. The field will automatically display your newly shortened link, a button to easily copy it, a summary of the contents of the link, how many clicks it has received and an option to join Bitly as so you can save and monitor all your shortened links. If all you want to do is use Bitly for the sake of shortening a link so it’s easier to share, you can do that no problem without signing up as a user. But if you’d like to keep your shortened links organized, access your links again in the future and track clicks on those links, then signing up for a free user account is probably a good idea. With a free user account, you only get access to the Your Bitlinks tab. To use the Dashboard, Custom Bitlinks and OneView tabs, you must upgrade to a premium account. On the Your Bitlinks tab, you'll see a bar graph showing the number of Bitlinks you created over the last week (or larger/smaller date range if you customize it using the dates in the top right) plus a brief summary of total clicks, top referrers and top location in the top left of the screen. Underneath this, you'll see your feed of Bitlinks on the left. Select a Bitlink to see a summary of its details on the right. To create a new Bitlink, hover your cursor over the orange Create button and select Bitlink from the dropdown menu. A field will appear on the right side of the screen where you'll be able to paste a long link and automatically see your link become a Bitlink. If you want, you can customize the last few characters of your Bitlink. When you're ready to use your Bitlink, select the Copy button to copy and paste it somewhere or the Share button to share it on Twitter or Facebook. Whenever you create a new Bitlink, it gets posted into your Bitlinks feed (with the most recent at the top and oldest at the bottom) so you can always refer back to it later. You can click on any link in the column in the bottom left to see its details on the right, including the title of the page that it links to, buttons to copy/share/edit it, traffic stats, referrers and locations. To keep your Bitlinks organized as you add more, you can select the checkbox beside any Bitlink in your feed to either tag it or hide it. You can use the search bar at the top to find specific Bitlinks by keyword or tag. You may have noticed other popular online sites and tools that automatically incorporate Bitlinks into their features. That’s because Bitly offers an open public API so that third-party services can take advantage of it. add the WordPress plugin to your WordPress site. Not quite happy with the bit.ly URL? No problem! Bitly is versatile enough that it supports branded short domains you purchase from a domain registrar. For example, back before About.com became DotDash.com, it had the branded short domain, abt.com. 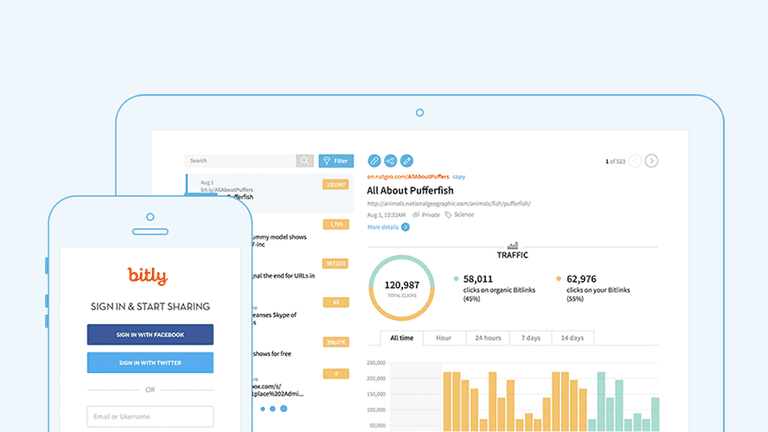 Bitly walks you through the process of setting your branded short domain up to work with the platform so that you can track your clicks and stats just like a regular Bitlink. Whenever you create a new Bitlink in Bitly, just select bit.ly above the long URL field to switch to using your own branded domain.